I was pretty stoked to see that this was bottled as part of their 'Bond Series' this year. I remember the first 'Hop Trip' release and loved it, but felt that it fell short each release after the first. 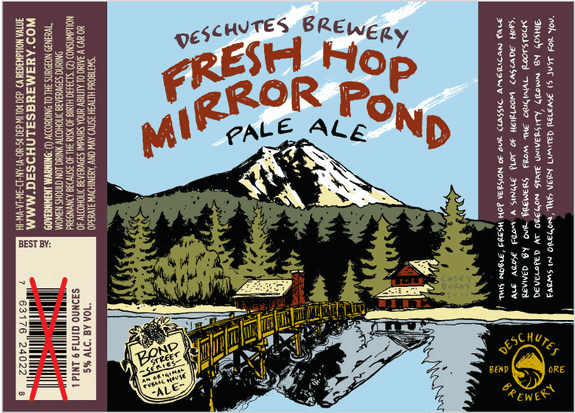 Fresh Hop Mirror Pond is certainly better, and I am glad to have it. "This noble, fresh hop version of our classic American pale ale arose from a single plot of heirloom Cascade hops. Revived by our brewers from the original rootstock developed at Oregon State University, grown by Goshie Farms in Oregon, this very limited release is just for you." Best by: 12/11/11 printed on the 22oz bottle release. I purchased it at Bridgetown Beerhouse for $5.45 ea. - Big fluffy fingers of white foamy head. Settled slowly and left thick creamy lacing all over the glass. Light shiny new copper penny color, clear, and lightly bubbling. - Wonderful NW hop aromas. Very pine-like, grassy, and floral. All my favorite hop characteristics. Light spice, and perhaps even a little subtle fruit in the background. Light caramel malt, and bready quality. This beer just smells super solid, and good. - My my.. what a crisp fantastically fresh and hoppy beer. Wonderfully light and very balanced flavors. Grassy herbal and pine hops with a light spice and floral character. Bready biscuity light caramel malt, and just simple. What a crisp and delightful eye opening beer. Beyond solid, and sets the standard for a pale ale. 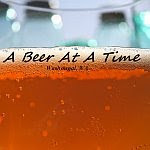 - Light bodied pale ale, slightly drying from the 40 IBU's, and certainly perfectly carbonated. Very easy to drink, and just the right light cloying touch. - Overall almost the perfect beer. Though I can see that this could potentially turn out different each year depending on the hops, and which were used. I must say though that this years is certainly up there at the top, and is something I hope to find many more of soon. A super good NW pale ale with just the right hoppy flare. Funny, I had reviewed the beer last year when I had it on tap, and this current review (without seeing or remembering my last) only nudged the appearance up half a point. The beer hasn't lost its touch.